BJGP Open 14 November 2017; BJGP-2017-0169. Background Antidepressant use has increased exponentially in recent decades, mostly due to long continuation. Aim To assess the effectiveness of a tailored recommendation to withdraw antidepressant treatment. Design & setting Randomised controlled trial in primary care (PANDA study) in the Netherlands. Method Long-term antidepressant users (≥9 months) were selected from GPs prescription databases. Patients were diagnosed with the Composite International Diagnostic Interview (CIDI). Long-term users without indication for maintenance treatment (overtreatment) were selected. The intervention consisted of disclosure of the current psychiatric diagnosis combined with a tailored treatment recommendation. Patients were followed for 12 months. Results The study included 146 participants from 45 family practices. Of the 70 patients in the intervention group, 34 (49%) did not comply with the advice to stop their antidepressant medication. Of the 36 (51%) patients who agreed to try, only 4 (6%) succeeded. These figures were consistent with the control group, where 6 (8%) of the 76 patients discontinued antidepressant use successfully. Patients who were recommended to discontinue their antidepressant medication reported a higher relapse rate than the control group (26% versus 13%, P = 0.05). Conclusion Changing inappropriate long-term antidepressant use is difficult. The intervention implies the discontinuation of antidepressant use, following the recommendations in the Dutch multidisciplinary guidelines for depressive and anxiety disorders . These are similar to those in the British NICE guidelines, recommending strict indications for the initiation, continuation and discontinuation of antidepressants . Although in a recent meta-analysis patients with a single depressive episode showed no difference in relapse rates between abrupt and gradual antidepressant discontinuation , we advised a gradual tapering program for the following reasons: 1) abrupt discontinuation may trigger a relapse in patients who suffered from an anxiety disorder or a recurrent depressive disorder at the time of initiating the antidepressant , and 2) discontinuation symptoms occur more frequently in patients who abruptly discontinue their antidepressants than in patients whose treatment is gradually tapered [17, 18]. The general prac-titioner receives a letter stating that the patient does not meet the criteria for a depressive or anxiety disorder in the past six months. 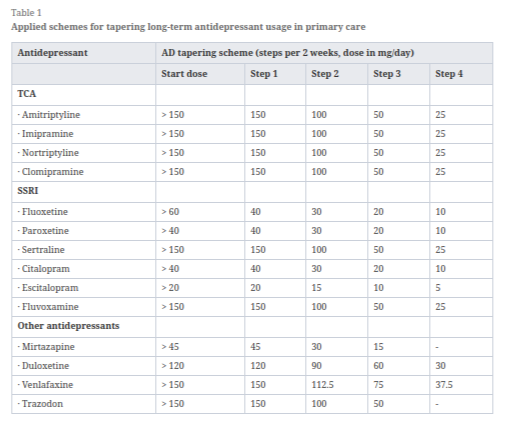 In addition, he or she receives an information sheet with current guidelines on antidepressant tapering and information about the discontinuation syndrome , including a detailed scheme for tapering for each patient (see Table 1). Duration of tapering was primarily based on the dosage and the half-life of the different antidepressants. No treatment restrictions are imposed on GP or patient in case of relapse or onset of a new psychiatric disorder after discontinuation. The tapering schedule is something like 25% every two weeks, with the decreases getting proportionately larger. Thank you for finding and highlighting this aspect of the research study, Alto. The conclusion of this study is very misleading in light of this kind of taper speed and shows that it's not the patients who are failing at discontinuing their drugs, but it's a failure of the medical establishment to get educated in safe tapering practices. In fact, a 25% percent taper every two weeks - knowing what we know now - should be considered unethical and cruel to the patients who signed up for the study. Yes, the REAL conclusion of the study is what we already know -- that the medical establishment is virtually CLUELESS when it comes to proper tapering efforts. This tapering method is frightening ! and criminal. Its no surprise to me that 49 % refused to participate in it. Its unbelievable that this is what they come up with in 2017!! Its disgusting. We agree with the comments by Fiona French and James Moore. At the time of developing and performing the trial, the Dutch guideline on depression advised to withdraw antidepressants by halving the dose every 2 weeks. There was no good evidence available at the time. Currently, we are running another trial on withdrawal of antidepressant medication with very slow reduction of the dose, acknowledging the fact mentioned in both comments that withdrawal is very difficult. This is just pathetic...what a cop out. No good evidence...give me a break. There is truckloads of evidence ...SA for a start then there was PP then there is the Icarus Project harm reduction guide...Peter Breggin....Joseph Glenmullen..... Even Gotzsche is aware of people tapering for 8 years! And what may I ask is the defn of 'slow' this time round. At least its acknowledged that wdl is very difficult...now there is a breakthrough realization. Shep is that Lucassen's link an email one ...if so then I hope every moderator on this site sends this guy an informing email. Sadly though sounds like the train has already left 'currently running'. SA for a start then there was PP then there is the Icarus Project harm reduction guide...Peter Breggin....Joseph Glenmullen..... Even Gotzsche is aware of people tapering for 8 years! Dr. Ashton was aware of it more than 30 years ago when she was running her benzo withdrawal clinic. You don't need to be a moderator to comment. Fiona and James did an excellent job. Just click on "Submit a Response to This Article" and a form comes up and you can submit your response for approval. Fiona and James were both critical of the study (as you can see in their letters) but their letters were still approved. Just sent a comment in. Very good to hear, NZ. Your thread contains a wealth of information and knowledge that you've gathered over the years, so I know you gave a very well-informed response. Thank you. Thanks Shep ..my response was rushed and so in hindsight was not as well mannered or as diplomatic as it could have been. It is not what I would call slow. In fact, it's much like Dr. Giovanni Fava's in Fava, 2007 Effects of gradual discontinuation of selective serotonin reuptake inhibitors in panic disorder with agoraphobia, which was a disaster. Note that the patients were assessed with the Composite International Diagnostic Interview (CIDI). The CIDI is a questionnaire for "mental disorders." Like every assessment instrument used in antidepressant discontinuation studies, it does not capture withdrawal symptoms. These instruments do not identify withdrawal symptoms, either. Although in a recent meta-analysis patients with a single depressive episode showed no difference in relapse rates between abrupt and gradual antidepressant discontinuation , we advised a gradual tapering program for the following reasons: 1) abrupt discontinuation may trigger a relapse in patients who suffered from an anxiety disorder or a recurrent depressive disorder at the time of initiating the antidepressant , and 2) discontinuation symptoms occur more frequently in patients who abruptly discontinue their antidepressants than in patients whose treatment is gradually tapered [17,18]. This study demonstrates the difficulty of correcting unnecessary (according to the guidelines) long-term antidepressant use, fuelled by an apprehensiveness regarding change on the part of both patient and GP. A recommendation to discontinue is not effective, and maybe even counterproductive. The authors advocate developing education programmes for GPs, including such topics as GPs’ attitudes towards discontinuation, appropriately motivating patients to discontinue antidepressant use, and managing the process of discontinuation. Notwithstanding, it is felt that the first, and possibly most important, step to prevent inappropriate long-term use of antidepressant medication in primary care is to be more restrictive in prescribing antidepressant medication in the first place and make more use of alternative, non-pharmalogical treatments. It might be useful to forewarn patients about the difficulty of discontinuing and to encourage using antidepressants only for a limited period. Regular review could possibly prevent both overtreatment and undertreatment. There was no exploration of the apprehensiveness on the part of the patient or the GP. Given that fear of withdrawal is probably highly prevalent among patients and perhaps somewhat prevalent among GPs -- who are completely lost when it comes to withdrawal symptoms -- I infer that the reason patients declined to go off the drug under guidance of the GP was because they did not trust the GP to get them off safely. The way the authors of this paper tiptoed around withdrawal symptoms -- avoiding the elephant in the room.....Or maybe they simply do not know that what follows going off antidepressants is not "relapse," but withdrawal syndrome. I’m coming to the conclusion that ‘they’ (medical people and researchers) only identify the initial ‘coarse’ symptoms - zaps etc - as wd and psych symptoms if they’re immediate. If there is a honeymoon period for mood issues, which we recognize as common, then that is considered a ‘relapse’. It is frustrating and means that all this research is much less useful than we’d like. They can barely identify their posteriors with both hands.